This is a medical-legal piece showing a dissection of the internal carotid artery. In this instance the word dissection does not refer to cutting something up to study. Here it is a tearing away of the interior wall of the carotid artery due to a spontaneous or traumatic injury. While once considered uncommon, spontaneous dissection is now known to be a cause of stroke among the middle-aged. Traumatic dissection on the other hand is caused by severe trauma to the head or neck – typically motor vehicle accidents and rapid deceleration but there are documented cases of dissection due to chiropractic adjustments. I actually have a chiro appointment tomorrow morning so let’s hope for the best. 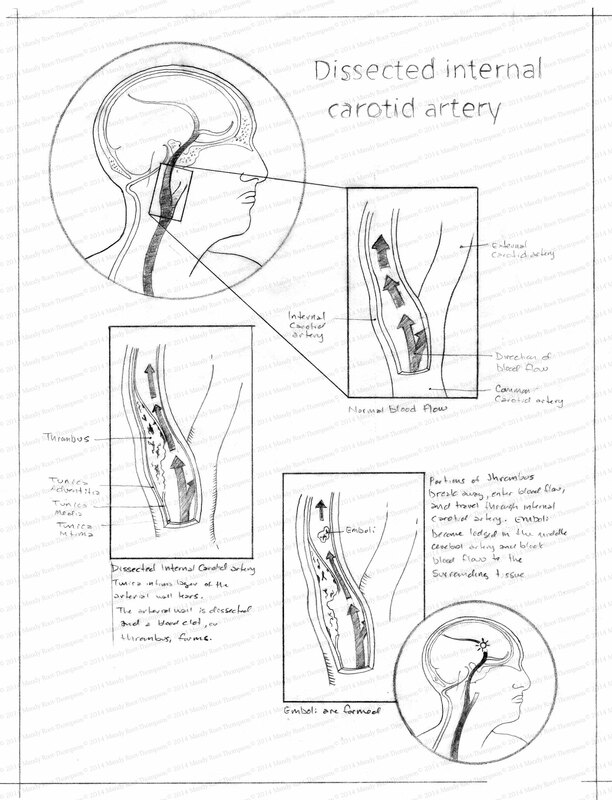 This first sketch is to show normal blood flow through the internal carotid artery. The second sketch shows a tear in the tunica intima layer of the arterial wall and the resulting thrombus (blood clot) that forms. The artery is made up of three walls. From the inside to the outside they are the tunica intima, tunica media, and tunica adventitia. 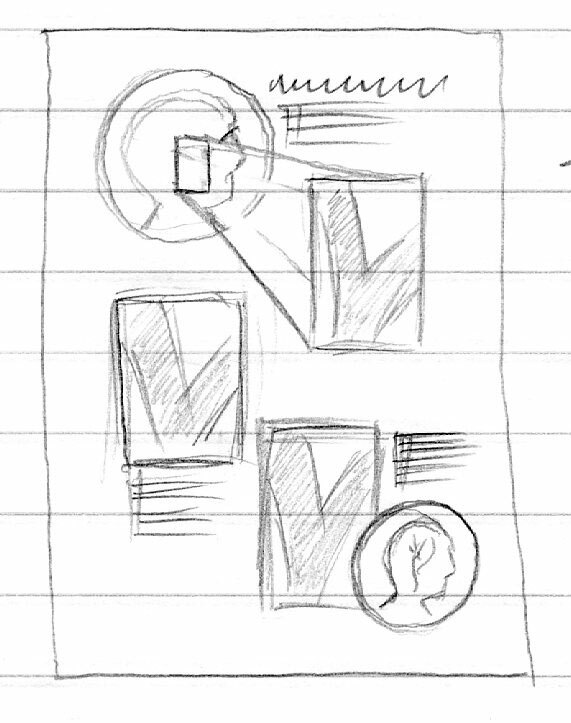 You can see a detailed sketch of the layers on the first image. The third sketch shows the emboli that are formed as portions of the thrombus break away and enter the blood flow. 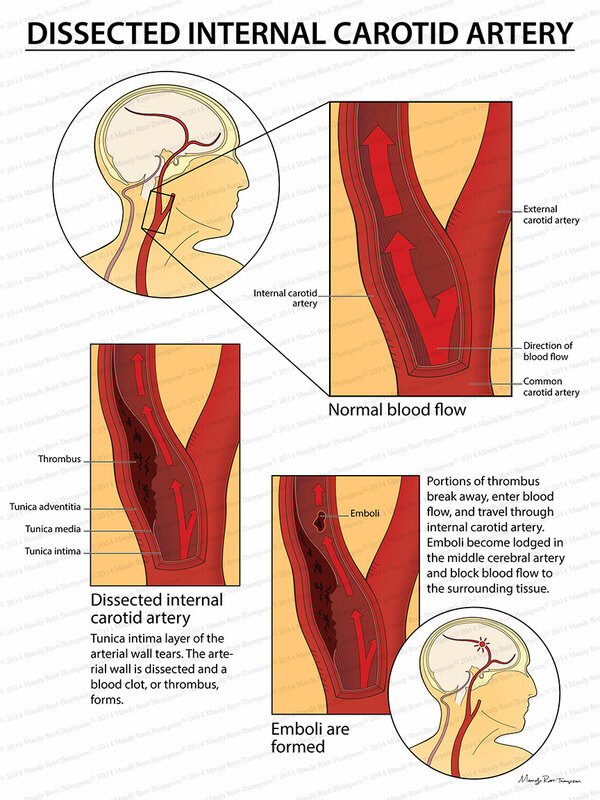 The final sketch shows the emboli making its way to the middle cerebral artery where it will block blood flow to the surrounding brain tissue resulting in stroke. Here are the layout sketches. When was the last time someone paid for your signature? © MedDrawStudio.com - All rights reserved.